Decorative oil and vinegar bottles make your dining table and kitchen counter look picture-perfect without ugly and cheap bottles stealing the show. Since you've clicked on this article, you're probably a homeowner who's conscious about your home's aesthetics but would want to save money by buying bulk at the same time. If you have purchased large bottles of oil and vinegar and you wish to preserve them in nice containers, then quality dispenser bottles are exactly what you need. However, keep in mind that decorative dispenser bottles for oil and vinegar vary. Below, we'll list all the aspects you need to consider when selecting oil and vinegar cruets to ensure you get the best containers for your needs. Spouts that come with cruets for oil and vinegar are available in varying styles. There are those that can protect liquid or oil from being constantly exposed to air, while some don't. If you want your oil to last longer without turning rancid, then you need dispensers with a dust cap. The dust cap offers an excellent protection when it covers the spout. Since you are on the lookout for decorative dispensers, you would want the ones that match or complement a room's existing design. But, your choice would entirely depend on your specific preference. Does your chosen dispenser come with a spout that pours fast? If that's what you want then you can go ahead and purchase the unit. However, we would suggest you choose a spout with a slow pouring action to gain more control over the amount of oil and vinegar you pour into your dishes and salads. Since you'll have more control over the amount of liquid that is released from the bottle, you'll enjoy an economical value out of the dispenser. Serve vinegar and oil in the most authentic Italian style possible with this Oil Vinegar Cruet by Andover Mills. It has a clever design that features two sections of different capacities. Each section has an individual pouring spout and cork to ensure the stored liquid is kept fresh and free from contamination. It's also angled to make pouring and serving easier. 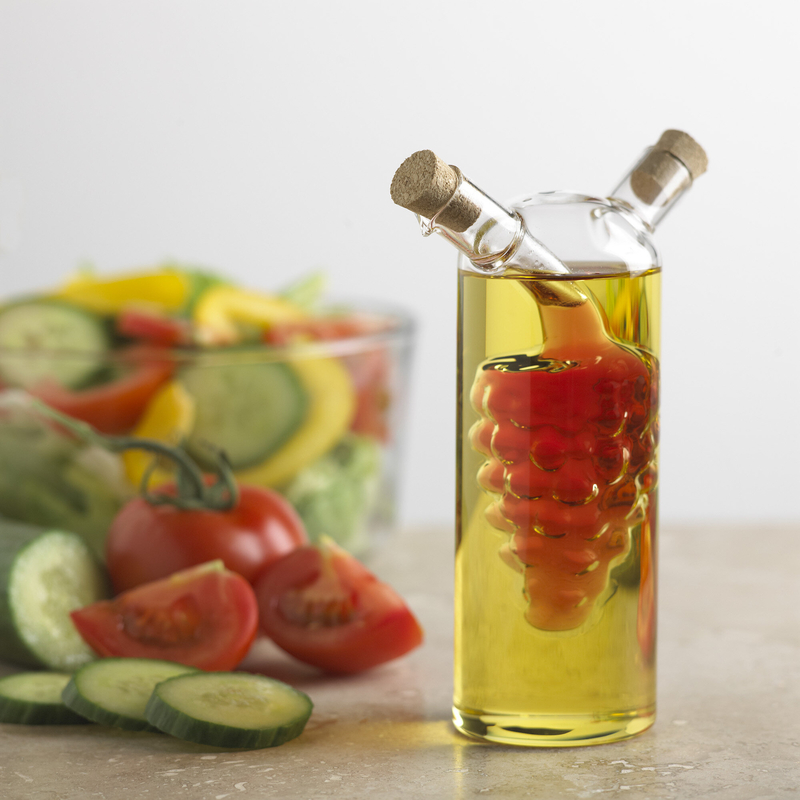 A 2-in-1 glass oil and vinegar cruet with cork stoppers, the interior section can be filled with balsamic vinegar while the exterior section filled with olive oil. It is the perfect cruet for storing, serving or pouring oil and vinegar. The best part about this product? It doubles as a beautiful display! A dripless 17-oz. bottle perfect for vinegar or oil storage and serving, this one's ideal for dining room tables and kitchen counters. It is made out of hygienic glass, then topped with a deluxe capped spout for easy pouring. Make your next meal feel more luxurious with this stylish product from Cuisinox. Enjoy pouring and serving with these drip-free stoneware vinegar dispensers. If you hate getting your hands and floors messy every single time you pour vinegar, these decorative bottles will eliminate the hassle in an instant! Each 13-oz container comes with its own spout. Elegant, presentable, and quirky at the same time, these vinegar and oil dispensers are clear enough to inform you if the bottles need refilling. This all glass set of dispensers comes with a funnel for quick and easy filling. The bottles can hold 10.8 oz. of vinegar or oil each. Since they are highly decorative with their fun silhouette, they will serve as conversation pieces during your next dinner party. If your kitchen is calling for chic bottle dispensers for oil and vinegar, then this set of two dispensing bottles is for you. The set is made from premium stoneware with a gorgeous silhouette to enhance the bottles' appearance. In terms of functionality, the bottles have stoppers for a neat, spill-proof pouring. Shaped and designed to perfection, it's the only set you need to store liquids, salt, and pepper. The caddy provides maximum stability, and it's a set that is ideal for any type of oil and liquid. Since it is made of ceramic, it can enhance and preserve the aroma and flavors of oil and vinegar unlike acrylic or plastic dispensers. The set's elegant look makes it a great addition to your dining room table. Being our personal favorite, this 3-pc set of highly decorative dispensers will bring class and sophistication to your dining room. It comes with an antique flair and rustic appeal, making it a striking addition to your space. The set can accommodate any type of liquid as well with its sealed top. If you want to use the bottles as home decor, you'll find them perfect to be placed on your fireplace mantle. Appearance-wise, the 9th placer on our list of the best oil and vinegar dispensers is guaranteed to impress anyone. Also, high-quality virgin olive oil is sensitive to light. It is, therefore, in need of a container that's well-protected like the oil dispenser that this set provides. Oil and vinegar can remain fresh inside these sealed containers. For such dainty kitchen bottles, the set is a steal for its current price. Why use cheap and ugly plastic for your vinegar and oils when you'll be able to use this sleek and beautiful set of glass bottle dispensers instead? Since the material is primarily glass, it is completely safe for liquid storage aside from being food-grade. Yes, no BPA nor PVCs to worry about with this set. With drip-free spouts, pouring and serving will always be easy and neat.